This is Nguyen Thi Thanh AKA The Lunch Lady. She’s one of my favorite street vendors in Saigon because she whips up amazing noodles everyday of the week. I enjoy her cooking so much that I blogged about her twice prior (here and here). To share my enthusiasm for her dishes with the greater Saigon community, I penned a piece about her in this month’s AsiaLIFE. She deserves all the good press I can churn out! Every morning before the sun rises, Nguyen Thi Thanh rolls out of bed, dons a comfy do bo (Vietnamese pyjamas), hops on her motorbike and heads to Thi Nghe Market. Thanh has been frequenting the same vendors for years, so everyone knows her by name and provides her with the freshest meats, noodles, herbs and vegetables. Thanh arrives home at 8 am and begins preparing the day’s noodle dish. All of her broths are made from scratch, and she is blessed with a certain touch that somehow allows her soup seasonings to simultaneously suit everyone’s tastes. An hour before noon, the broth is finally perfect, and a crowd of customers gathered under a shady tree near her apartment is ready to dig into a hot bowl of noodles. This well-worn routine has been a part of Thanh’s life for the past decade, and she wouldn’t have it any other way. On Mondays, Thanh makes bun Thai. 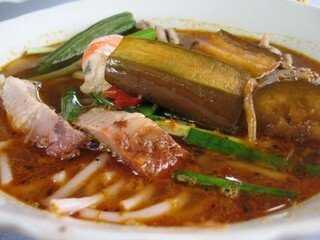 The broth is inspired by Thailand’s classic tom yum goong soup and has a spicy kick that hits the back of one’s throat. 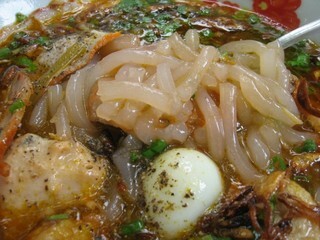 Thick and rounded rice noodles, squid, fried fish cakes and a single shrimp round out the dish. Tuesdays feature a double punch of banh canh and bun moc. Both dishes are comprised of a satisfying collection of meats, deep-fried shallots and a deeply flavourful and deftly salted pork-based broth, but they employ different noodles. The bun moc uses vermicelli rice noodles, while banh canh contains a thick udon-like noodle with a bite. Wednesdays bring an element of surprise. Depending on what ingredients are available at the market, Thanh chooses to prepare either mi ga tiem or hu tieu Nam Vang. Though traditionally made with duck, Thanh opts for chicken in her mi ga tiem because it’s leaner. 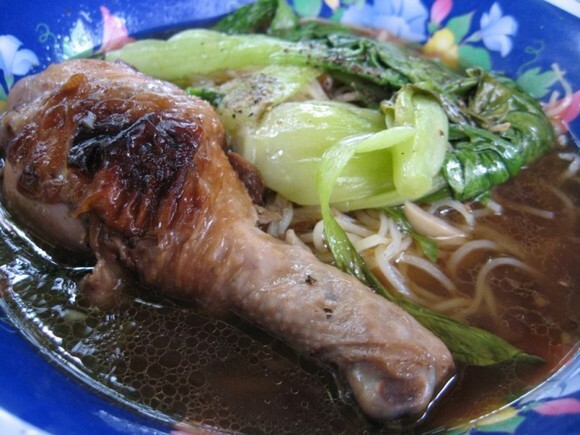 The best part of the dish is the sweet star anise broth that is poured over fresh egg noodles. The pickled green papaya served on the side isn’t too shabby either. Hu tieu Nam Vang is a Cambodian-Chinese concoction that the Vietnamese borrowed and made their own; it consists of a sweet pork broth and a number of odds and ends like quail eggs, innards and liver. Nam Vang is the Vietnamese word for Phnom Penh. Customers can choose between two types of noodles with this dish—mi (egg noodles) or hu tieu (opaque rice noodles). Thursday’s dish is consistently bun mam, which comes with pineapple, eggplant, barbecued pork (thit heo quay), shrimp, okra, chives and thick rice noodles. The fermented fish broth is amazingly aromatic and pairs well with the mix of fruits, vegetables and meats. Thanh’s bun bo Hue on Fridays is a huge draw. The broth has a deep lemongrass flavour and just a hint of spiciness, and there’s always a generous amount of tender meat. Thanh avoids gristly meat by adding a whole pineapple to the broth, which tenderizes the meat and imparts a bit of sweetness to the broth. Saturdays she prepares banh canh once more, but this time around it is a more classic rendition with a crab-based broth rather than a pork one. In addition to slippery udon-like noodles, this dish contains fish cakes, fried shallots and a quail egg. Sundays feature a triple threat of bun thit nuong, bun nem nuong and bun cha gio, a series of broth-less rice vermicelli dishes topped with grilled meats, egg rolls, herbs, bean sprouts and a fish sauce vinaigrette. Thanh says that these dishes are especially labor intensive because she must skewer the meat onto individual bamboo skewers. Her hard work definitely pays off—she often sells out before 1 pm. To supplement her noodles, Thanh has rounded up her relatives and neighbors to sell appetizers, beverages and desserts near her stall. Thus it is possible for lunch-goers to enjoy a three-course meal under one shady tree. Her sister Mai Thi Hoa has small stall next to hers selling incredibly fresh spring rolls with shrimp, pork, bean sprouts and chives (goi cuon). The hoisin sauce, which can either make or break goi cuon, is solid. Her niece and nephew-in-law sell a variety of che, including ones with grass jelly, basil seeds and banana essence. Around 1 pm each day, a woman rolls her cart to the bustling shady tree and dishes up delicious bowls of warm silken tofu with a sweet ginger syrup and tapioca balls. Completing the cast of vendors is a neighbor who sells soft drinks and sinh to (fruit smoothies) to thirsty diners. 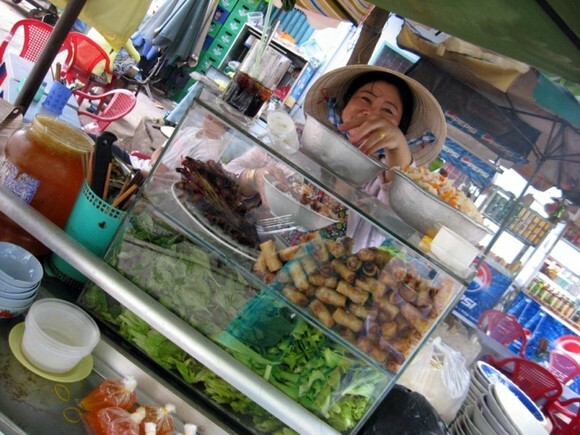 Thanh’s knack for noodles and keen business sense sets her apart from her hawker counterparts. A full-service restaurant experience in the form of street food is nothing short of brilliant. See also: Lunch Lady, Her Noodles Bring All the Boys to the Yard, and Life After Bourdain: Reuniting with the Lunch Lady. She sure has some business sense and some of the creation you’re mentioning about I have yet to see back in SoCal or either I haven’t ventured out enough. such great looking food. too bad we weren’t able to check out her stall on our last trip. I guess we will have to save this one for next time. Who knows, with all this publicity, the next time we visit she’ll have her own shop! Thanks for the write up and keep us updated with the Lunch Lady’s whereabouts. What a lovely lady! Love the big wide smile. What is that brown stuff in the big aluminum bowl? Looks like cashews (hạt điều). Oh yeah, cashews are great. I would imagine that the traditional Vietnamese noodle dishes are accompanied with the prerequisite side helping of bean sprouts, herbs and other raw vegetables. However, what about the other “imported” noodle dishes? I usually put in a lot of vegetables to take the edge off the oily broth. You are very lucky to have access to such delicious food. I am jealous. Next time I’m in Vietnam, I know where to go and hopefully she will still be there. Thanks for the great post! Thanks for sharing this article. Very well-written and tantalizing to the palate! What a great lunch lady (and a great article too)! I don’t think I’ve ever heard of a street vendor who changes their wares daily – I like her style! I couldn’t find her stall address in this post. So her stall is near your office which is located at 23 Hoang Sa Dis. 1, Saigon right? 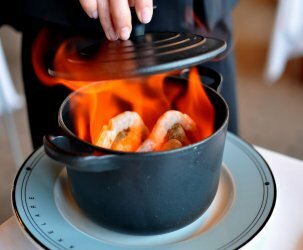 nhbilly – I think that all of these dishes are available in SoCal, but not sure if there are any restaurants that specialize in them. I know this awesome restaurant down in San Diego that makes mi vit tiem on El Cajon Blvd. anh – She’s been around for 10+ years, so I’m pretty certain she’ll be around for 10 more, but you never know…there’s always talks of the govt. banning street food. Long – The bowls is filled crushed peanuts for bun thit nuong day. All of her noodles are served with either fresh herbs and greens or “dunked” herbs and greens that have been softened in boiling water. The imported noodle dish is served with Chrysantheum leaves. quyenann – Lucky indeed. I hope she’ll be around for a good long time! Ben – You’re right. One of the designer’s at AsiaLIFE made a great map depicting her stand. I’ll post it as soon as I get my hands on it for clarity’s sake. Karen – I’ll post a map soon! And make sure to send them to Ngu Vien. can’t wait for you map!!! um, I forget to ask. What time does she serve? Ben – she serves from 11 AM to 1:30. Come early! Sometimes she runs out and I’m stuck eating com binh dan across the street. Rick – Have a great trip and I’d love to hear all about it when you get back! Eat TONS (or kilos) of squid for me too. she was showcased and mentioned on anthony bourdain’s no reservation program on the travel channel tonight. 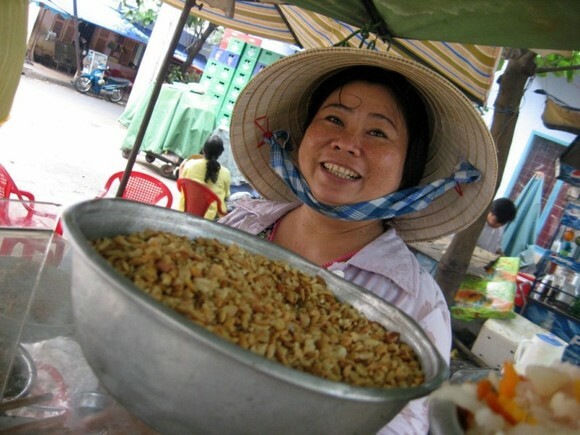 I saw her on no reservations and I can’t wait to go to vietnam. Not that I’m going there any time soon,but I can dream. Ah. I am so jealous of Tony Bourdain for his travels!! After he stated the “Lunch Lady” could be Googled I immediately came here to search for her. Even missed the rest of Tonys” show to read the reviews. I do not know if I will ever be lucky enough to make it to the “Lunch Ladys'” street in Vietnam but I can always dream!! Wow, your “Lunch Lady” was on “No Reservations” on the Travel Channel and it looked so good! Lucky you. I saw her on the “Vietnam” episode of “No Reservations” last night. It sure looks good! Gastronomer – can you tell me a name of the mi vit tiem on El Cajon Blvd, San Diego? I came here cause bourdain told me to google LUNCH LADY!!!! HOLY HELLL THAT SOUP DOES EFFING LOOK GOOD!!!!!!!! 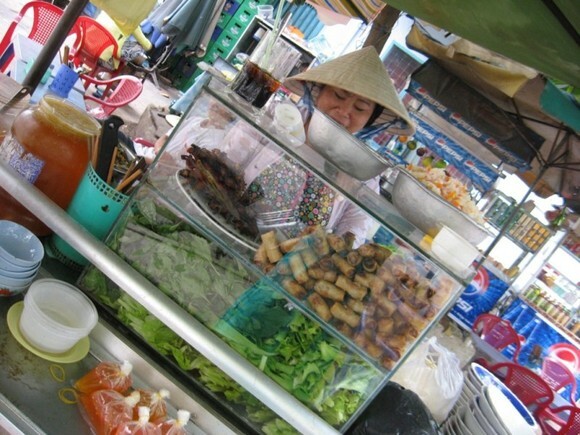 How far is the Lunch Lady’s noodle stall from 23 Hoang Sa Street? Thanks a bunch? The next time I’m in Vietnam, I will for sure check out the Lunch Lady!!! 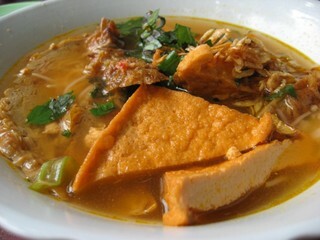 Soups chua benh cua co ay linh hon. Dua tuoi cung duoc su dung de lam cho len men anchovies Thai vao nuoc mam. I’ve heard so much of this woman’s food. when i go to Saigon i will mae sure not to miss her. But does she wash her hands? I HEAR ABOUT “THE LUNCH LADY” ON NO RESERVATIONS…..TONY SAID TO GOOGLE IT…..ALTHOUGH I HAVE NEVER EATEN ANY VIETNAMESE FOOD, HER SOUPS MAKE ME WANT TO TRY IT REALLY SOON. ANTHONY BOURDAIN IS SO FREAKING HOT!! I LOVE THE SHOW!! Went to the “lucnh lady” twice this week in Saigon, her soup is no joke, we had Banh Canh and Bun Mam, the Banh Canh was insane compared to others I had in Saigon, so much flavor in the broth! Eric, stay home, astronaut ice cream should be good for you. went looking for her last week, but couldnt find her. Do i find her on Hoang Sa st opposite the “river”? Tom – You’re very, very close. Ask your xe om driver to drop you off at 23 Hoang Sa — that’s the office of AsiaLIFE magazine. She is located a stone’s throw from there. You can ask the receptionist for help. Also, remember that she only serves food from 11:30 to 1:30 or so. Earlier is better. Bangkok and Saigon would be my 2 target destinations here in Southeast Asia when it comes to food tasting. Man I love Asian food and hope to see the Lunch Lady and taste her famous soups and noodles. Thanks Anthony Bourdain for finding her for us. Nguyen Thi Minh Khai is the street the big dentist is on right?… If so, I know where I’m going… and her stall is on Hoang Sa? I love bun cha gio, I had it when we were there last year, so cannot wait to go back next year, I’m heading there.. maybe before Quan An Ngon, have to take the kids there. Man I’ve been missing Saigon, can’t wait to go back. I was in Saigon a few years ago and I missed her!! Now I have to go back just to taste the soup! Oh wow, I saw her on the Travel Channel last night in No Reservations with Anthony Bourdain and he praised her bun bo hue. I just came back to America last month and I missed this lady while I was in Saigon. Thanks for sharing this wonderful eatery and I will definitely put this place on my itinerary next trip back to see my family. I am in Saigon for the weekend and decided to try food from the lunch lady. However she was nowhere to be found! Undeterred, my friend and I found a nearby internet cafe to look for the exact location. We were in the right area. We walked back to where we thought it was and we found a group of Americans from Habitat for Humanity standing around a little Vietnamese woman. They found the lunch lady, but apparently she had the day off. I was really looking forward to the bun thit nuong too! C’est la vie! Just returned from a quick 3 day trip to Saigon. Thanks to Anthony Bourdain and this site we were in soup heaven on Tuesday and Thursday. We planned on going to the lunch only once but after Tuesday’s meal we knew we had to try and make it back one more time. It was well worth the trip. 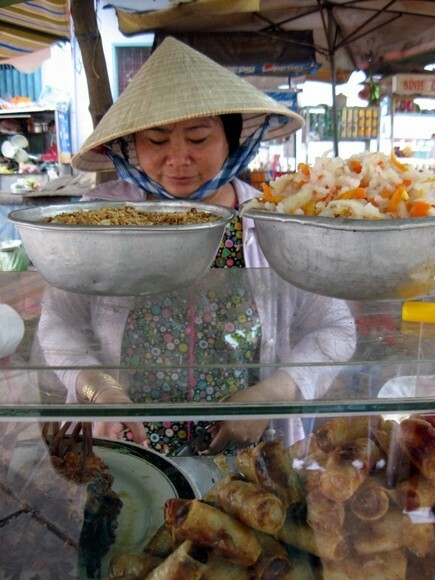 It’s ppl like her that make us all fall in love w/Vietnam’s authentic dining scene. Although I much prefer dining at restaurants I’ll eat at a street vendor if recommended based on cleanliness and of course deliciousness. What Quan is she in? David – She’s located in District 1. Anthony Bourdain wasn’t kidding, I googled Thailand Lunch Lady & here I am! hi cathy, we’ll be in HCMC next week and thanks to this great posting we’ll be able to track her down! I’m here in Saigon and only have a few days left in the city. On Sunday at about 11AM I drove to 23 Hoang Sa and Nguyen Thi Minh Khai but can’t find the lunch lady!! Does anyone know which landmarks I should look for or any other clues to find her? This was my one thing to do in Saigon! We found her this morning. She has a great Hu Tieu Nam Vang in town. OH MAN. My buddy and I just ate this woman’s cart. It was some of the most delicious food I have ever tried. I am gonna go there everyday. It’s impossible to explain how good it is, and I would’ve gladly paid at least 20 times as much money for it if anything near this existed in America’s vietnamese restraunts (I mean it’s like 75 cents or something). Probably gonna eat 3 bowls tomorrow. On a side note, our taxi driver did get lost trying to find the area for about 15 minutes or so, but only charged us for up to the time when he started going in the wrong direction. (it was like 2 dollars) The quest was WELL worth it. Your blog is a godsend. I cannot wait to visit the Lunch Lady with my parents (who also enjoy street foods). Had her bun bo hue. It was ok. not great. Tried to visit the “Lunch Lady” today at about noon. She was nowhere to be found – I’m pretty certain I was in the right spot. Perhaps she sometimes takes the day off on Sundays? just got back from Vietname, went to the Lunch Lady 4 times. She was not open on Sunday. The lunch lady definately has it going on! I love food like this. I”m a typical white male frome the states. I really enjoy the ethnic food wonders that are in my community. thanks to Anthony Boourdain it makes me want to visit this nice lady and experience the wonders of her rolling kitchen. Thanks Anthony! anthony bourdain featured this delightful and dynamic woman and her culinary skills on the episode of his show, “no reservations,” which was devoted to vietnamese cuisine and which aired on the food channel on february 1, 2010.
thanx for the map, I will be there in a few days….can’t wait! Thanks, man. And thanks, Anthony Bourdain. This stall is in my next itinerary. excelente lo que hace esta mujer, la vi en el programa de anthony bourdain SIN RESERVAS, me gustaria ir a este pais y probar su gastronomia. saludos desde VENEZUELA. I didnt get to taste her other dishes but I will come again this summer. Ha! I just saw Anthony Bourdain on No Reservations talking about this lady. He said to google her, so I did and here she is! Wonderful. Thanks for all of the great info on the Lunch Lady. 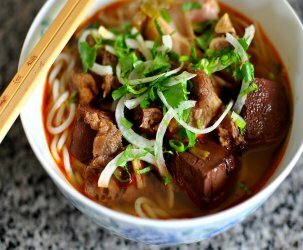 I will be in Vietnam September 1-14 and plan on eating her bo bun hue on the first Friday I’m there. Can’t wait! 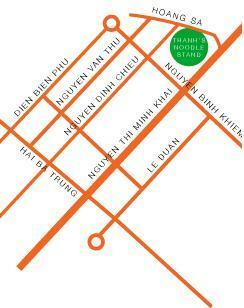 I used a local guide name Van to arrange a day trip of Saigon. That was the best day I have had in Vietnam. We did typical tour of Saigon in the morning to museums, markets & wacky tour in the afternoon with the Lunch Lady (great food and nice smile); Cyclo around the city; coffee at local cafe and local massage (very interesting). We were three guys & we had great experience! I went to 23 Hoang Sa yesterday to film the Lunch Lady for my children but there was not such a “Lunch Lady” food stand! Perhaps the map was wrong? Nhan Hoang. Nhan Hoang – Perhaps you arrived when she was already sold out? Dozens of people have followed the map successfully. Better luck next time! I am Vietnamese & I live in Saigon, I know street very well, but it took me 30 minutes to find the Lunch Lady. You know what I did when I could not find her? I stopped at the cafe internet nearby, had a coffee while surfing the Google again. When I saw the pictures with Beer Plastic Baskets behind the Lunch Lady, that how I could find her. There are many, many food stalls nearby & it is hard to find her. She is not really at 23 Hoang Sa street. Please not that she is off on Sunday & she sells just from 11.00 am to the food is out, around 01.00 pm to 02.00 pm. I WANT TO TRY HER FOOD. Vanessa – I reside in Los Angeles and not Saigon, so I can’t say for sure. Go to her stall during lunchtime and see for yourself. A sense of adventure is important while traveling about the world. Have fun! Have just moved to Saigon and the girls in the office took me there for lunch! 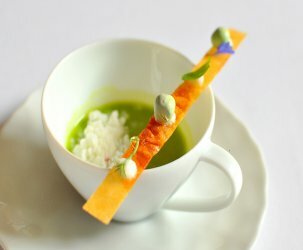 Most amazing soup I have tasted. The broth was sensational. Will be going back there again many times over the next year!! 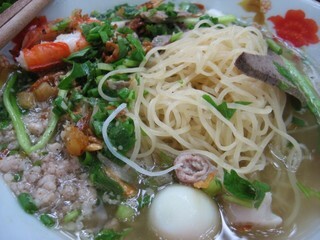 Just came back from HCM City last weekend, tried the lunch lady, absolutely splendid! Thanks to your blog. A must try that guidebooks don’t tell you. Thanks for providing info for this legendary lady in Vietnam, come check out and follow my site when you can. She’s definitely still there. Thanks so much for this post and the map. Soup today had chicken, what seemed like yams, and maybe liver? It was in a delicious, and beautiful, orange colored broth. I neglected to ask her what it was. Though she seems to have raised her prices (can you blame her?) to 35,000. Though that included two fresh spring rolls from her sister. This plus the bun cha you recommended in your Hanoi top 10 are easily my favorite things I’ve had in Vietnam (and that’s saying something!) Thanks for this incredibly helpful blog. Yes she is still there I have been a follower of your blogfor a while and I went to visit my brother who is a lecturer out there and I happened across this post so had to go see for myself. Thanks for the heads up the food was amazing! I saw the lunch lady on no reservations. She obviously has good food. I hope to visit Viet Nam again in 2013 for the third time and she is definitely on my list. Can’t wait. We have just watched Anthony BORDAIN at the lunch lady’s place. We are heading back to Viet Nam and Saigon in a few weeks. (my fifth time including a year with the Australian Army in 1970-71 and my wife’s third time. We just love the country and it’s people. Definitely going to find the Lunch Lady her soups had me drooling in front of the telly. My wife loves spring rolls and the ones on this website that the Lunch Lady does has got my wife all excited as well. Can’t wait to get back there. It is so good that someone like Anthony Bourdain takes the time to improve someones life. It is also good that it did not change the ambiance. This woman Nguyen Thi Thanh is now known world wide. Almost like the soup guy on friends only much nicer. It’s so great to see there are still people who think about their customers. Granted, she may not want to raise her prices to keep more customers, but on the other hand she looks like she is truly a nice person. Kudos to her! As of August 3rd 2012 she is still there and still charging very reasonable prices for life alteringly good food. Hell, she’s still wearing the same hat. Halfway through my meal a giant ant fell into my broth. My death should be so delicious. Going again tomorrow. Will be going to Saigon in a few weeks for the first time. Going to try my very best to find her!!!! Just recently came back from Vietnam about 4 months ago and had the pleasure of trying her very awesome soup. She was so nice enough to take a picture with us. This was definitely one of the highlights of my trip to Vietnam! Seething with jealousy – cannot wait to escape the daily grind of the corporate world and exchange my suit for pyjamas. This lady knows where it’s at! Food looks downright delicious as well! Been in VN since 12/26. Am in Saigon now and went to chi Thanh’s noodle stand yesterday (Friday) for her bun bo hue. Very tasty. Afterward, I talked to her one on one for about 10 minutes. She is very nice and friendly and customer focused. It took me awhile to find her noodle stand because it’s no longer on Hoang Sa street. I only found her after asking a vendor on Hoang Sa. She is now in a “hem” off Hoang Sa. The address on the business card she gave me (I’m looking at it as I type) is below. Her noodle stand now has a large banner on top which says “Qua’n A(n Lunch Lady” in large words. I’m glad she knows how to take advantage of your advertising for her and Anthony Bourdain’s feature on his No Reservation segment on VN. Her business seems to do very well. I arrived around 12:30 and her big pot of broth barely had any broth left for my bowl of bun bo hue. There was a large tour bus at her stand when I arrived, and it left full of tourists about 5 minutes afterward. Only then could I find a table to sit (I went by myself as my travel party had gone to Ben Tre for a wedding). As I finished eating, she also ran out of noodle and soup and ended her lunch service, around 1PM. I’m going to Phu Quoc tomorrow (1/6) to join my travel party there. We will all return to Saigon on 1/9 for a few days. I told her that will return Friday 1/10 with more customers. That’s when she gave me her business card and asked me to call ahead of time so she can prepare for my party. As I stood there talking to her, tourists were snapping photos of her, her noodle stand, etc. There was also a Vietnamese photographer for a local paper taking photos of her with me and then her by herself. She was all smiles. Like I said, very nice lady. Here’s her business card info (front side). My camera broke so I can’t take a photo of it at the moment. I’ll take a photo of both sides (front has address and phone number, back has daily menu) and will e-mail it to you at a later date. The noodles are tasty, but there’s a special foreigner price of about 10k more, which is only US 50 cents, but it is a bit of a turn-off for me. Costs are rising in Saigon, so I think these days it’s up to 20k for locals and 30k for foreigners. It’s still a good deal though– a lot of places are charging 60k or more for noodle soups. fyi: prices are now $40K vnd for a bowl…and $30k vnd if you are a local. $6K vnd for an eggroll or spring roll. I asked why the price difference and she said she puts more meat into the the $40K bowl. however, this isn’t true base on my observation when others get their food and then pay. I understand it’s only a 50 cent $usd difference, but like the last comment, it’s a matter of principle. imagine if you had to pay 25% more for everything simply b/c you are a foreigner. Ate here a few times, tried dishes like hu tieu, mien ga and bun thit nuong, have to say it is completely over rated, the food is mediocre at best and pretty commercial, its now geared up for foreigners. There are many better street food vendors elsewhere in the city. Pingback: Foods of Vietnam | Itchy Feet on the Cheap Foods of Vietnam | More lasting memories for less. Don’t believe the reviews that say it’s not that great. It depends which day you go. I went twice, one day it was mind bogglingly good and the other time it was just descent. They were two completely different dishes. Hieu hong? I think it also depends on what is available to her at the market the day you go. Try it, and enjoy it! Looks like it became a conglomerate of other family vendors using her fame. I was seated and given summer rolls, fried spring rolls and a bowl of chicken soup. I wasn’t asked if I want to orde all this food. I guess should can get just the bowl for 40K, but you’ll have to be aware. Chicken and potatoes were hard. Potatoe wasn’t even cooked all the way. Atmosphere was not really there. Looks like they need a vacation.